Wikimedia Community User Group Greece is a group of users of Greek Wikimedia projects who are interested in organizing and participating in outreach activities on national level. We have been active for many years already doing among others many educational partnerships, workshops, presentations in free software events (see Fosscomm 2012), Mediawiki Geek Day 2013 or edit-a-thons organized in June 2013 on el.wp as part of the World War I edit-a-thons and later. 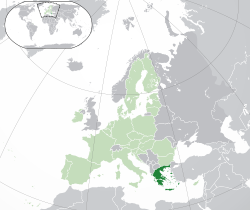 WM CUG Greece has been recognised as a Wikimedia User Group by the AffCom in July 2013. Although Wikimedia Greece is a chapter in discussion phase on Meta we strongly support the creation of an official User Group since the numbers of our community members at the moment are not sufficient for the creation of a chapter and surely not the numbers we expected to have two years ago. But there is still a tight group of Wikimedia projects users who are enjoying outreach activities and would like to get on with this work. Having that in mind we would prefer to work as an officially recognized group in order to have the advantages of using the trademarks and logos of Wikimedia, if possible, in our promotional activities. Access to grants from the foundation is not among our urgent concerns yet. We cover the cost for domain names and other petty cash from our pockets. An event or project with a wider scope may need funding in the future when our group will be mature enough to organize it. We held a conference on October of 2011 which was attended by about 20 persons. The first day of this conference was devoted strictly to discussions about the creation of WM-GR. Today we want to confirm the continuing interest of those who supported an active Wikimedia chapter at that time and we could surely work as a User Group at the beginning. Regular meetings in major cities of Greece for discussions, workshops, editathons etc. Wikimedia Education Program Greece. There are already some initiatives especially in Medical and Mathematical schools of the Aristotle University of Thessaloniki in cooperation with OKFN-Greece. There were editathons and Wikipedia assignments for students over the last three years. You can see more about the work that is already done in public educational institutions of Greece from a wide range of users who are not necessarily members of our user group on this page. We plan to go further. Anyone can join our usergroup, even those who don’t have an account on a Wikimedia wikiproject. Newbies are not only welcome but are encouraged to take part in our events and outreach activities as members on a trial basis. See how you can start learning and at the same time participate in WUG-GR. Have participated, being physically present, in one of our meetings of users that have taken place in various cities/places in Greece or to have met one of the members of the user group in person. Be an active user on any project of WUG-GR and to continue being an active user as long as you participate to the team. Have a minimum number of edits (greater than 100 total and at least 50 in the last 6 months) in the main namespace, namespace:category and namespace:template on any single Wikimedia Project (in Modern Greek or any other language, though not 100 cumulative edits in all the projects that you contribute). You should participate as much as possible in the activities of the group, for example in the organization of events, presentations and workshops, the production of manuals and educational materials or support of the functional needs of the User Group, and so on. Overall abstention from contributions and participation will mean that you lose your rights to participate in the decision-making process of the Group, as well as to have access to administrative resources and materials of the Group. Have read and accepted the group’s Member Rights and Responsibilities. Your participation is not allowed if you oppose by your positions or actions to the core values of WMF, create functional obstacles to WMF projects, or act in bad faith in the User Group. Ρay on time the annual membership fee (as of 2019 it is five euros 5€) (this rule is not applied to students, people with disabilities, people who are doing their compulsory military service, or they are unemployed). The fee can be changed by decision of the User Group and will go into effect the year after the decision was taken. This text is a translation of the respective Greek text which is hosted under the title Προϋποθέσεις συμμετοχής στο WM-GR on wikimedia.gr/wiki. For any dispute about the accuracy of meaning between the Greek and English version the Greek text prevails. Education Program: Online tutorials for educators. Education Program: AUTH, Department of Mathematics, 2015. Education Program: AUTH, Medicine School. Assignment to translate medical articles. Education Program: Ionian University. Assignment to translate articles about italian culture. Lecture on Wikipedia, in AUTH's Scool of Journalism and New Media. June 2013: An edit-a-thon promoted by Wikimedia Sverige and organized by our team for the first time in Greece had very encouraging results (12 participants from Greece, 19 new articles written, many articles were improved, at least 17 pictures added to articles and the winner of the prize also was from Greece). Repeat the Wikipedia Lab, a series of weekly workshops on Wikipedia, Wikimedia Commons and Wikidata. Continue and expand the Wikipedia Education Program. This page was last edited on 20 April 2019, at 19:08.